An all inclusive holiday is basically a wallet-free one which gives you the freedom to dine and drink without fear of seeing the bill upon checkout. In this article we reveal exactly what is included in an all inclusive holiday, and list some of our famous all inclusive resorts, so that you can find out if this type of board package is best for your needs. What Does Maldives All-Inclusive Include? All inclusive typically means that it’s all included. So you will receive breakfast, lunch, dinner, snacks, soft drinks, and alcoholic beverages during your stay. Things differ from resort to resort, for example, some resorts offer enormous buffet breakfasts with a whole host of juices, smoothies, drinks, pastries, fruits, desserts, sweet treats, and other delicious delicacies for you to enjoy. While others may offer a simple continental breakfast to get you up and going for the day. When it comes to lunches and dinners, some resorts also work on a buffet basis while others will have a la carte menu options so you can choose your dishes. Don’t worry if you have any special dietary requirements as all resorts are able to cater for vegan, vegetarian, gluten-free guests. It’s a good idea though to let them know your needs in advance so that the chef can make sure that you are properly catered for. On top of this, many all inclusive Maldives resorts will throw a ton of extras so that you can have an amazing vacation away. This can include things such as free watersport rentals, fitness classes, tennis lessons, art classes, or a special private dinner in one of the more exclusive restaurants on the island that typically you would have to pay for. Some even offer a fully stocked mini bar filled with water, drinks, chocolates, and snacks that you can enjoy on your holiday free of charge. Others will include things like discounts and gift certificates for the resort spa or salon. Again, what’s not included in these Maldives resorts will depend on where you stay, but typically things like seaplane and boat transfers will come at an additional cost. Your international flights will not be included in an all inclusive package unless you are booking a complete Maldives package holiday. Is a Maldives All Inclusive Holiday Right For You? 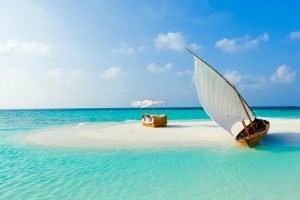 Maldives all inclusive packages are probably one of the best ways to go for many people when it comes to a Maldives vacation. This is because you simply book your holiday and have a peace of mind knowing that all of your food and drinks are paid for in advance. The Maldives are a pretty expensive destination, partly because almost everything has to be imported into the tiny Islands which can put up prices by quite a lot. On top of this, there are often high service charges and import fees which you will be required to pay should you choose to buy all your meals and drinks separately. This can turn a simple lunch into a rather expensive meal, so be sure to carefully consider your costs if you are thinking of going room-only. Check out this article for more information on traditional Maldivian cuisine. All inclusive is also a great option if you’re travelling with kids, as you know how they get hungry throughout the day they can simply make use of the snack bars. If you enjoy a drink or two then all inclusive is also an amazing option as your beverages will be included in the package price, just make sure that you always check exactly what your package includes before you book as different Maldives resorts have their own terms and conditions when it comes to what’s included. For example, some will include only locally produced alcohol and spirits while others will include things like fine wines and champagnes. Some of the top resorts even allow you to go down into the wine cellar and pick out a few special bottles that you can enjoy in your villa during your stay. Unsurprisingly, all inclusive packages can be pretty pricey, with the average over water villa in the Maldives costing upwards of around $1,000 per night. When you take into consideration and all of the meals drinks and extras that are included it actually works out to be pretty great value indeed. If you’re thinking of skipping a island resort and instead going for a more local Maldivian holiday, then you may want to look at a room-only option or a bed and breakfast. Because you’ll be exploring the local communities and what’s on offer around the island, you may actually find that it’s better for you to eat out. Full board is where you will receive breakfast, lunch, and dinner each day. It differs from all inclusive options because snacks, soft drinks and alcoholic drinks will typically not be included as part of your package. It will also not include things like excursions and activities, although some resorts world put together special deals that include a few freebies and extras for guests. Half board simply means that you will receive a breakfast and a dinner, but you will have to pay for your own lunch. Again, snacks and drinks activities are not included in the cost. 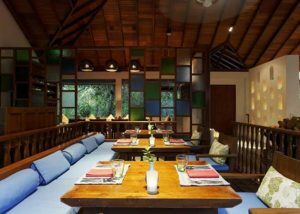 A half board option can be good choice if you want the freedom of choosing to dine at different restaurants in the resort for lunch. Bed and breakfast is where you will receive a breakfast but no other meals drinks or snacks. This option is actually quite rare in the Maldives as many of the resorts only go for the all inclusive, full board or half board options. However, some of the smaller family-run guest on the local Islands will offer a bed and breakfast service. This is where you pay for your room and no other additional meals or drinks are included. If you’re staying in one of the luxury Maldives resorts and choosing to go for a room only option, then make sure you put aside a sufficient amount to cover the cost of your meals and drinks, as these can really add up over the course of a week or two. If you’re staying in one of the local Islands, then a room only option could be very affordable as it gives you the chance to go out and sample local dishes without being tied down to only eating at your hotel. A few of the local guesthouses may actually offer self catering options, whereby you can have a small kitchen to prepare some of your food and drinks yourself. If you’re travelling with that special someone and leaving with kids at home, then maybe you want to think about booking adults-only all inclusive resort. These will have a much more quiet, romantic vibe that is much more suited to loved-up couples than to families. 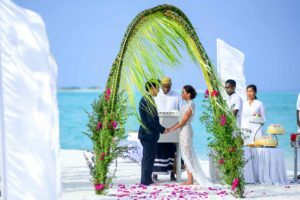 If you’re planning a wedding, then our article on Maldives weddings reveals everything you need to know before you book. Some of our favourite adults-only all inclusive resorts include Centara Ras fushi Resort and Spa, and Como by Cocoa Island Resort (click on the links for more photos and to book). 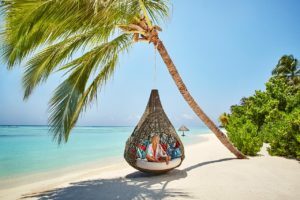 The Maldives aren’t known for being a particularly cheap holiday destination, however, savvy travellers have a number of tips and tricks up their sleeves in order to score the best deals. If you want to enjoy all the luxury of that the Maldives offer, but don’t have a huge amount to spend, then you may want to think about travelling during one of the off-peak months. 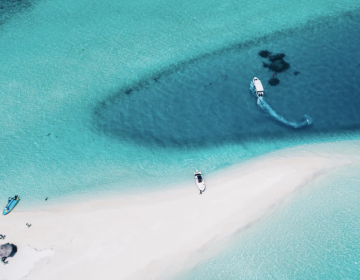 The Maldives off-peak season runs between May to November, during this time the weather can be pretty unpredictable with frequent downpours depending on which month you choose to go. On the other hand, it’s the time when really can find those best low-cost Maldives holidays. During this time the Maldives resorts are often a lot quieter too, so you’ll find you get it a little slice of paradise to yourself. 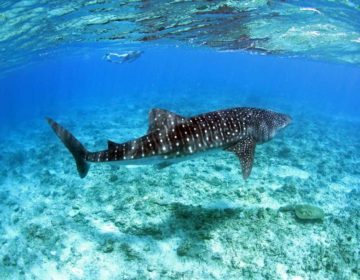 Check out this article for the best time to visit the Maldives. You can also use flight comparison sites like SkyScanner to search for return flights over the duration of a whole month, and then schedule your trip based on the best flight deals. Try travelling mid-week and avoid weekend departures and special holidays in order to get the best prices around. Make sure that you do your research and shop around, you can also use cash back sites to further save money off your flight and Maldives accommodation. If you’re flexible then try leaving things to the last minute and you might find an incredible last minute deal. You can also try using flight points to redeem them for cheap airline fares or even get a flight upgrade on your Maldives vacation. 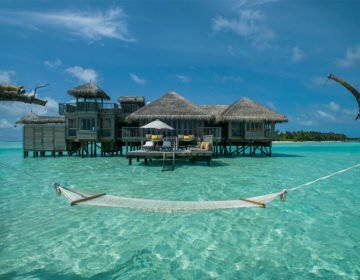 If you’re thinking of booking an all inclusive getaway to the Maldives, then it is best to do a little research before you leave. Start by checking the reviews on some of the major review sites such as TripAdvisor, even if the website says that there’s a huge selection of dining options available to choose from, you want to see what pass guests have written so that you can get an idea if the food is top-notch and going to satisfy you. With all inclusive vacations, you want to make sure that you have a lot of choice and variety otherwise things can get a little boring after a two-week vacation when you’re constantly served similar foods and meals. As soon as you arrive make sure that you have a full tour of the resort, and know where all the dining facilities and snack bars are. Also get clear on all those little extras that they’re going to throw in and when you need to use them by. There’s nothing worse than leaving remembering that you forgot to use that free massage voucher. Finally, even though it’s all inclusive, there maybe a few things that you will actually need to pay for on vacation. One of these things is tipping, and even though many of the resorts say that tipping and service charges are included, if you have exceptional service or a favorite bartender then you may actually want to leave a little extra for them just to the show your appreciation. Overall, an all inclusive Maldives vacation is a great choice – not only for your stomach – but also for your wallet. No matter if you’re on a romantic getaway for two, or taking the whole family in tow, an all inclusive will truly allow you to relax and unwind in one of the most beautiful destinations in the world. If you want a little more freedom when it comes to dining out then perhaps consider a half board option so you can choose your dining destination for lunch. No matter what Maldives resort you choose, you’ll be sure to have an incredible trip. Happy travels!